For minor adjustments on vintage-style truss rod nuts. Vintage-style truss rod nuts have very thin yet wide slots and are made of unhardened steel, so normal slotted screwdrivers will cause damage - as evidenced on many vintage guitars and basses. The Cheater Driver was designed for minor adjustments without neck removal on most vintage-style guitar and bass truss rod nuts. In order to have the best results, you should prepare your instrument and understand limitations of the tool. A little background is in order. Early Fender guitars and basses use a "cross screw" nut for truss rod adjustment, which has two slots arranged in a crossing pattern. Cross screw fasteners achieved popularity during the early 20th century because a second slot was provided in case the first became damaged. Early Fender designers may have seen this as beneficial, especially since modern hex drive nuts weren't yet available. In addition to older instruments, many vintage reproduction guitars and basses make use of cross screw nuts. Adjustment of cross screw nuts presents several problems. Nuts are made of unhardened steel which is soft and easily damaged. Slots tends to be very thin, yet the nut is approximately 3/8" (9mm) wide. As a result, standard slotted screwdrivers don't properly fit. Large slotted screwdrivers would be preferred due to greater width, but their tips are typically too thick to fit into the nut's slot. Smaller screwdrivers may provide a better fit but only contact a small portion of the slot with damage likely after several uses. 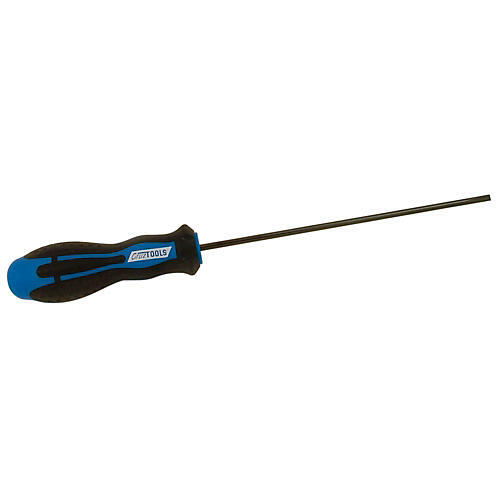 While CruzTOOLS normally recommends removal of the neck and use of their Standard Truss Rod Driver (Sku#H94735), there are times when quick minor adjustments are desired. The Cheater Driver was developed for this purpose, with the same tip profile as the Standard Driver but reduced to 4mm width to fit the exposed portion of the slot. Since adjustments will be made with the neck attached, a long 175mm shaft allows easy access to the nut and an oversized handle provides necessary grip for the relatively high torques needed. It's oversized handle with extra-long shaft gives you a firm grip and easier access. Order this convenient tool today. Order today!